Learning how to play the guitar is a fun, relaxing and excellent activity which also improves coordination and artistic sensibility. When you start playing for the first time, it is essential to have a good guitar. While we cannot pick an item for you, we have looked at some of the most popular products available and, judging after the user feedback and product specifications, our team wrote some beginner guitars reviews to accurately and objectively describe some of the hottest instruments out there. What makes this choice so accessible is the fact that it is a complete set which includes almost all you need to own before getting started. The electro-acoustic guitar can be plugged into an amplifier, but it can also be played acoustically. It is a left-handed instrument, meaning that it is only suitable for those who intend to play with their left hand. The guitar features a high gloss natural finish and built-in volume and tone controls. It is a full-size model with enclosed die cast tuning gears specific to more professional models. The scale is 25.5 inches in length, the fingerboard is rosewood, and the top is spruce. It also includes a truss rod, a pickup, and the set contains picks and a gig bag. A rather high-end product, this acoustic guitar is made from the highest quality wood and offers a warm, rich sound found in professional instruments. Appreciated for its excellent build and reliability, it is a choice for those who want a little bit more from their device. It can be only played acoustically. It has a silver leaf maple neck and a shorter, 24.84-inch scale with a rosewood fretboard. This makes the guitar easy on the fingers, while the specially aligned machined heads allow you to tune it, guaranteeing to remain tuned quickly. Other features include a solid cedar top, wild cherry back and sides and a Tusq bridge nut with a compensated saddle. Another popular option is the Fender Tim Armstrong Hellcat guitar – this electroacoustic instrument has excellent sound and includes many features which will make learning how to play it a lot more exciting and pleasant. Including a preamp with built-in tuner, it can be amplified or played acoustically. The solid mahogany top and laminated mahogany back and sides contribute to the guitar’s excellent sound. It has a rosewood bridge and a compensated saddle, features which help its quality. Die-cast, chrome tuners allow you to quickly and easily tune it. Other highlights included are a 4-ply tortoiseshell pickguard, cream body bindings, and white dot bridge pins. This excellent guitar for beginners is affordable without sacrificing quality. It is a suitable learning instrument, either for a beginner or a young musician, having a balanced tone and plenty of projection. With a body made from Whitewood, it brings out the middle-range frequencies, giving it a bright sound. A painted maple bridge and the well-made fingerboard offer you an instrument that’s easy to play, which adds clarity to each note. It has a C-shape neck which helps you develop your skills while learning intricate fretboard movements. The hardware is made from nickel, and the tuners are covered, making it easy to tune. It is affordable, and it also has great value for the money. 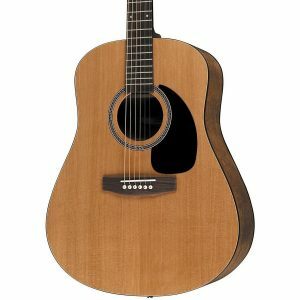 Featuring the looks and performance of a professional guitar at an affordable price, this electro-acoustic is one of the most popular choices in this field. It can be played acoustically or amplified, depending on what you want to do with it. The many features it includes make it a favorite instrument which has excellent value for the money. With a mahogany top and body, the guitar guarantees a clear, bright sound which will match that one of more professional models. The set neck is another prime feature, while the rosewood fingerboard and satin-nickel hardware offer it quality and durability, meaning it can be used by advanced students too. Guitars are perhaps the most famous musical instruments in the world. Almost all bands enjoyed by teenagers use one or more of them, so it is plausible that they might want to start learning how to play it – this activity is recreational, pleasant and brings about brain improvements no other hobbies do. However, it might turn out to be quite time-consuming to find a beginner guitar for sale, since they are not cheap, and there are many different features you have to think about. It is essential to research the market before making a decision correctly. Factors you have to take into consideration include size, materials, build and ways of playing it. These determine the final price, the value for the money and also the user’s future progress – if it is easy to play and performs well, there are fewer chances of seeing the student give up the lessons. Guitars are excellent and favorite Christmas presents for guys, being offered as gifts in some other situations: birthdays, graduations or other moments. Before you start searching for the best beginner guitar to provide as a present, think of what the recipient usually likes, concerning colors, shapes, and sound. What is very important is for you to check the hand that the guitar is meant to be played with – left-handed models are available too! When you’re looking for the right guitar to help you increase your musical skills, you might be faced with a challenging decision. In order to be sure that you’ve taken all the crucial aspects into consideration, check out the advice in our buying guide below. Usually, guitars can be divided into three different categories: electric, electro acoustic and acoustic. This division is made by how the sound is transmitted. Electric guitars can be played unplugged, but since they have a solid body the volume will be deficient – they are better played through amplifiers or other electronic playback devices. Electroacoustic models are a combination of acoustic and electric guitars, meaning that they have a hollow body which resonates and offers you a louder sound when unplugged. However, electronic pickups are included (and other features, too) so they can be played with or without amplifiers, this being particularly useful when performing live in a hall. Acoustic instruments cannot be amplified immediately, and are the simplest of them all – their hollow body resonates so you can hear the sound loud and clear. Without electronics, they can be played anywhere and in almost any conditions. Some consider electric guitars to be more comfortable to play, but for a beginner, it is essential to learn on an instrument which can also be performed acoustically. This is why most recommendations suggest that good guitars for beginners are electroacoustic or acoustic models. The first type has the advantage of being cheap and of not requiring electronics to be played, while the latter can work (with limited performance) as an electric guitar, too. All guitars for beginners are made of wood and contain metal hardware and, sometimes, plastic pieces. There are many options available, and each influence the sound you will get and also the overall price. Having an instrument made from high-quality materials is essential, as its performance depends on how good they are. Popular options are mahogany for the top and body, rosewood for the fretboard and nickel for the hardware. The neck can be made of maple, but there are other choices available too. If you go for an electroacoustic model, the electronics should have proper wiring – shielded cables will provide a clear sound without noise and imperfections. Durable tuners are usually made from nickel and sometimes steel; their quality is crucial for the playability of the instrument. Having a high-quality guitar depends not only on the materials used to manufacture it but also on the build. The fretboard must be straight, without any imperfections; even though this is not specified, most customers are incredibly exigent and will point out any flaws in the review section. Solid construction will last longer in time and will offer performance for more extended periods of time. As widespread and affordable teen gifts, guitars should also match the personal tastes of those receiving them. It might seem unlikely, but the looks matter a lot, especially when it comes to a musical instrument which might be played together with friends or classmates. This is why you should consider checking what their favorite bands are playing, apart from their preferences in colors and types of finish. Many replicas of famous instruments are available at attractive prices, so getting one of those is not that complicated. Regarding colors, you can find anything you can imagine. Blue, black, red or natural wood colors are all available, and can sometimes be custom-ordered. This makes finding gifts to get your boyfriend a lot easier, as there is surely something out there matching his style. Available finishes are gloss or satin, both having related prices and offering similar performances. When searching for the best guitar for beginners, perhaps the most suitable option is buying a complete starter set. Such kits include the instrument itself, made by a specific brand and with accurately described characteristics, as well as many other guitar gadgets you might find useful – these are not always made by the same manufacturer. Picks, electronic tuners, tab books and other handy items are delivered. A gig bag or flight case is always included. Buying such a set is a lot more adequate than purchasing the instrument alone because usually other accessories are required to start playing. With a starter pack, everything you need is already included so you can unpack, tune and jump straight to playing. When going for an electroacoustic guitar, you might want to make sure that the pickup is a high-quality model. When playing through an amplifier, apart from the processors and effects used, the thing which will matter most is the pickup; therefore, you should not jump for the most inexpensive item you find, but instead, try to search something with great value for the money. Guitars are prone to suffering damage from falls caused by incorrect storage. When not playing, store it in a gig bag if you own one or, if not, purchase a small guitar stand for your instrument. Maintenance is also required, but it is not as complicated as one might think. Certain substances are available for cleaning the fretboard and the body, while the texture of the rosewood can be preserved by using the specified oils and softeners.